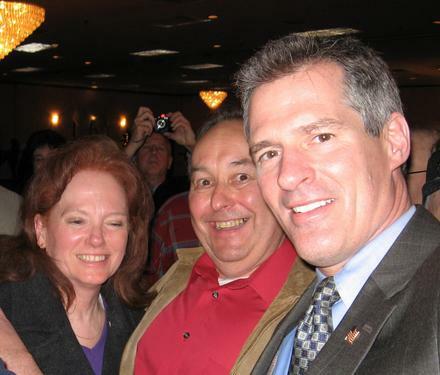 T his is a picture taken at Christina’s in Walpole, Massachusetts, the last stop on Scott Brown’s victory tour. There were a few thousand people there. Senator Brown made a few short remarks and spent the rest of the time shaking hands and talking to the people who had come to see him. There were people of all ages in the crowd. There were parents with young children and older children. One of the people standing near me was a World War II veteran. There was someone there I talked to who was a Union member who generally voted Democrat, but had voted for Scott Brown. There was another young man there who was involved in starting an alternative biofuel company and was interested in passing information along to the Senator. There was a young man who was involved in construction who had worked on Scott Brown’s campaign because he was out of work. It was impressive to see that many people come out on a cold Sunday night to see our new Senator and to wish him well. Best wishes, Senator Brown, may you bring to Washington to same honesty and integrity you have shown in Massachusetts. The Obama Administration has done something right. Now don’t panic. But they did. Breitbart.com (and Bettina H. Chavanne and Michael Bruno at Aviation Week) are reporting on the sale of more than $6 billion in military equipment to Taiwan. Needless to say, China is protesting the sale. I’m not really sure Taiwan considers itself a part of China. Unfortunately, the only way to deal with a bully is to stand up to him. China is not a free country and cannot be depended upon to allow Taiwan to exist in peace. The only way to keep Taiwan free is to make sure it has the weapons it needs to defend itself. I am impressed that the Obama Administration is upholding the freedom of Taiwan. Power Line reported yesterday on the progress being made in putting together the upcoming Iraqi elections. There was a bit of a sticking point as hundreds of Sunni candidates who were planning on running in the elections were disqualified because of alleged ties to the Baath Party. The Iraqi constitution states that former Baathists cannot hold public office. A crisis in the election has been averted and a compromise reached. Watching Iraq form a democracy is something like raising a teenager–there are a lot of things that can go wrong, but sometimes you just have to focus on the things that are going right. Ed Morrissey at Hot Air reports today that the wind turbines the State of Minnesota purchased to provide an alternative energy source for the state do not work in cold weather. When the state purchased them (for a mere $3.3 million for eleven wind turbines), the manufacturing company said they would work in cold weather. “Special hydraulic fluid designed for colder temperatures was used in the turbines, but it’s not working, so neither are the turbines. I guess if we have enough global warming, the wind turbines will work. The article points out that wind power can be a good additional or supplemental source of energy, but it is not yet reliable as a primary source of power. We are not yet at a point as a nation or as an economy where we can give up carbon-based fuel. The only way we will reach that point is if the government lets the free market do its own research and reap its own rewards. Why Did The Stock Market Fall On Friday ? Investor’s Business Daily posted a very interesting article yesterday after the stock market closed down on Friday. The economic news that came out Friday was very positive–the economy posted its best gain in six years–so why did the stock market go down? President Obama’s problem is his policies and the people charged with putting them in place. As you can see, Obama has appointed a group of people with lots of ideas and little practical experience. The article points out that every initiative that is coming out of this White House is anti-business–the auto industry takeover, the cap and trade bill, the proposed bank regulations, etc. I’m really not sure if President Obama is capable of changing to a pro-business (rather than a pro-union) administration, but I suspect that if he is not willing to make a course correction, the ballot box will do it for him. Why Is Paul Kirk, Jr., Voting In The Senate ? On Thursday, according to The Hill, the Senate voted for a $290 billion debt-limit increase in the federal budget. Other than the fact that this shows how out of control spending is, there are some other things to consider here. The measure needed sixty votes to pass. It received those sixty votes because all of the Democrats voted for it (with the exception of Senator Evan Bayh of Indiana) and one Republican voted for it (Senator George Voinovich of Ohio). Senator Paul Kirk, Jr., of Massachusetts voted for the measure. Why is that important? The vote of Senator Kirk was needed to pass the measure. The purpose of the measure is to raise the debt ceiling far enough so that the Democrats in Congress don’t have to raise it again in an election year. Senator Kirk’s vote is important because of the circumstances that allowed him to vote. During the last year of his life, Ted Kennedy cast very few votes in the Senate. For that year, Massachusetts had, in essence, one Senator. As Senator Kennedy was dying, it suddenly became very important for Massachusetts to be correctly represented in the Senate, and the laws of the state were changed to allow the Governor of Massachusetts to appoint a Senator rather than wait for the special election required by law. The law was changed in Massachusetts and went into effect immediately (against the State constitution, but the Court in the State upheld the politics–not the law). Scott Brown was elected to the Senate on January 19th. He has not been certified, sworn in, or allowed to vote yet. Niki Tsongas who won a special election in Massachusetts on October 16, 2007, with 51 per cent of the votes was sworn in and voting on October 17, 2007. Scott Brown won 52 per cent of the votes. At the very least, Paul Kirk, Jr., should refrain from voting on any issues in the future. He has never been elected to the Senate and should make way for someone who was. Does anyone know when Scott Brown will be sworn in? Might I Suggest Yucca Flats? According to yesterday’s New York Daily News, the White House has asked to Justice Department to look into alternate venues (other than New York City) for holding the trial of Khalid Sheikh Mohammed. Mayor Bloomberg and other political leaders in New York City have protested the trial because of the increased risk to the city and because of the high cost of security for the city during the trial. Have they truly considered the downside of trying Khalid Sheikh Mohammed in a civilian court? First of all, the defense has to have access to all information against the defendant. This gives a lawyer for a terrorist access to our intelligence and how we collected it. There have in the past been instances of lawyers of terrorists passing information back to terrorist networks. We really do not need that to happen here. Secondly, do we really want to provide a platform for this fanatic to spout his rhetoric? Third, has anyone considered the circus this trial is likely to become? For further insight into this, see the recent RightWingGranny article on the trial of ‘Lady Al Qaeda’ currently playing in New York City. Khalid Sheikh Mohammed is a terrorist. He is not an American citizen. Why he would be entitled to all the rights and privileges of an American citizen after plotting to kill thousands of American citizens is beyond me! A few days ago James O’Keefe was arrested in Louisiana and accused of attempting to wiretap Mary Landrieu’s office. Well, as the facts are coming out, this doesn’t seem to be the case. The Washington Examiner reported today that Mr. O’Keefe did not even have wiretapping equipment in his possession. “The government has now confirmed what has always been clear: No one tried to wiretap or bug Senator Landrieu’s office. Nor did we try to cut or shut down her phone lines. Reports to this effect over the past 48 hours are inaccurate and false. It seems as if the government might have overreacted a bit in this case. It seems that there are charges against Mr. O’Keefe that may prove valid, but it is obvious that the media attempt to smear Mr. O’Keefe and ultimately Andrew Breitbart fell flat. I would also like to mention at this point that there were many Americans who reported not being able to contact their Senators and Representatives during the healthcare debate. I think the election of Scott Brown in Massachusetts was the only way many Americans felt that they would be heard. Will This Bill Ever Die ? “Senate Democratic leader Harry Reid reiterated there was no rush to pass the healthcare overhaul, the object of more than six months of intense political brawling in Congress. This is a very interesting statement for a variety of reasons. Remember how important it was to get healthcare reform passed last fall? Now there’s no rush. The other thing to remember as this goes forward is that all of the House of Representatives and one third of the Senate are up for election in about ten months. That fact alone will make it very hard to get any major legislation passed this year–especially legislation that is so unpopular with the voters. “ABC News’ Rick Klein and Jonathan Karl report: The renewed optimism voiced by some Democrats over the prospects of passing a health care bill may be just a little premature. Frankly, unless all Democrats running for office have a burning desire to leave Washington after the 2010 elections, I really doubt this bill will pass. The Superbowl is February 7. It should be a great game. The commercials are always interesting because they represent the cutting edge of what is happening in the advertising world. They are sometimes controversial because of either the content, the approach, or the cost. This year is no exception. Today’s Washington Examiner posted a story on a Superbowl advertisement taken out by Focus on the Family. The ad shows Tim Tebow and his mother talking about her decision not to abort him despite being warned by doctors of a serious health risk. Under normal circumstances this would be an inspiring story, but we have reached the point in our culture where an inspiring story that involves choosing not to have an abortion is no longer inspiring–it’s ‘sexist’ and in some circles called ‘hate speech’ or divisive. I am looking forward to seeing the ad. My Way news did a basic fact check on some of the major points of President Obama’s speech last night. They pointed out differences between his actions and his words in a few major areas. The proposed freeze on government spending for the next three years (if Congress agrees to it) would amount to less than 1 percent of the deficit. The proposal is similar to the proposal President Obama criticized John McCain for during the presidential campaign. An executive order to form a fiscal commission would have little chance of success. The reason many Republicans voted against the idea is that they see it as a smoke screen to be used to cover Democrat tax increases. The proposed healthcare bill has already been shown to prevent many people from staying with their current healthcare plans–for example, Medicare Advantage (with the exception made for the state of Florida). Attempts to limit the influence of lobbyists are somewhat disingenuous. Lobbyists have as much influence in the Obama Administration as they have had in the past. The article also deals with the issues of transparency in this administration and jobs created by the stimulus. The problems in these areas are obvious. It is an interesting article, but the truly interesting part of the article is the fact that it was written. There was a time when any criticism of Obama would have been fact checked–not his speeches. Don’t Be Fooled By Tonight’s Speech!!! This chart is from Wikipedia.com. Unfortunately any promise made to freeze spending at the current level is only a temporary measure while they figure out how to raise everyone’s taxes without getting all Democrats voted out of office! I apologize to any regular readers of this site for repeating this link, but I am not enough of a computer geek to know how to keep something at the top of my web page indefinitely! This is the link to today’s blog entry from Team Rubicon in Haiti. Their blog shows pictures of what they are doing and also has an entry from someone else working there. The team is privately funded–they paid their own way there with personal credit cards–and would appreciate donations of any amount to help cover their expenses. Donations are tax deductible–information is at their website. If you have wanted to give to Haiti in some way, but haven’t found your outlet yet, please check out Team Rubicon. You can easily follow exactly how your donation is being used. Power Line reported yesterday on the trial of Aafia Siddiqui, also known as “Lady al Qaeda.” The trial is taking place in federal court in New York City. Lady al Qaeda had to be ejected from the courtroom twice. There was also an incident where a spectator formed the likeness of a gun with his hand and threatened the jury. Two of the jurors were dismissed because they felt threatened. If the trial of this ‘lady’ can cause so much chaos, can you imagine what the trial of Khalid Sheikh Mohammed is going to be like? As anyone who has ‘fought city hall’ will tell you, sometimes things are not as they appear to be. Yesterday’s New York Times reported that James O’Keefe had been arrested in New Orleans for plotting to tamper with the telephone system in the New Orleans office of Senator Mary Landrieu, Democrat of Louisiana. What the actual truth of the story is I don’t know, but what I think will be interesting to watch is how the major media reporting of the story tries to link Andrew Breitbart to the arrest. If you remember, James O’Keefe was the young man responsible for making the ACORN videos showing ACORN employees willing to help someone break the law. Andrew Breitbart was, to a large extent, responsible for getting them out on the internet. The non-mainstream media reporting on this can be found (currently) in three places–Hot Air, Hugh Hewitt‘s website, and BigGovernment.com. Big Government is Andrew Breitbart’s website, and from what I understand, he will be doing his best to bring you the whole story. As you read the mainstream media reports on this incident, please keep one thing in mind. Andrew Breitbart at Big Government has fought ACORN and is fighting government corruption. There are a lot of people in government and in the media who would prefer that his website were not around. Whatever the truth is in this story, the story will be used to try to put an end to the Big Government website’s credibility. If you understand the tactics being used to silence people who oppose big government and liberal policies, you are less likely to fall for those tactics. Cleveland.com has uncovered the idently of Ellie Light. Who is Ellie Light? Ellie Light is the name used in a number of letters showing support for President Obama written to some 60-plus newspaper editors around the country. Ellie Light claimed in her letters to be a resident of whatever community the newspaper represented. Ellie Light is actually Barbara Brooks who lives in Bakersfield, California. Actually, the update on the article at Cleveland.com now claims that the letter writer is Barbara Brooks ex-husband. I wonder what the truth actually is! This basically dishonest and misleading. I understand her wanting to have her political viewpoints heard (that’s why this blog exists), but I do question her methods. In the age of the internet and of local elections which have national impact, I guess all of us (including newspaper editors) need to be very careful of our sources. Rich Lowry has posted an op-ed at the New York Post today about the Obama Administration’s treatment of Umar Farouk Abdulmutallab, the Christmas Day underwear bomber. Mr. Lowry viewed Umar Abdulmutallab as a sort of message in a bottle to our national security team trying to deal with the ever-present threat of terrorism. Unfortunately this decision may come back to haunt us. The article points out the steps that should have been taken to get information on ongoing terrorist plots against our country, but were not taken. It also points out that if the Obama Administration had been adamant about trying Mr. Abdulmutallab in a civilian court, they still could have done it after getting information from him on the terrorists camps and activities in Yemen. Hopefully the information Mr. Abdulmutallab had in his head can be learned from other sources. I am sure there is much there that would have been helpful to our intelligence agencies. Townhall.com reported Monday on one section of the American economy that has grown since President Obama took office. This is not good news for all of us taxpayers. The article points out the differences between collective bargaining in a private sector setting versus collective bargaining in the public sector setting. In the private sector, profits have to be considered–with no profit there is no company. This keeps the demands of the unions in check. In the public sector, there is nothing to prevent excessive union demands–the state, federal government, or municipality can simply raise taxes. Meanwhile, state and local government employees make more than private sector employees. The average wage for a government employee is $39.83 an hour in wages and benefits; the average wage for a person in the private sector is $27.49 an hour in wages and benefits. That is a difference of almost $500 a week or $26,000 a year. That is serious money when you figure that it is coming out of someone else’s pocket. Whose Teeth Are They, Anyway ? Boston.com is reporting that a new law went into effect on January 1st in Massachusetts that will require that all children in day care longer than four hours and/or who eat a meal to have their teeth brushed on-site. Parents are allowed to opt out of this rule (at least for the time being). In a time of rising unemployment, dropping house prices, a growing state fiscal deficit, and terrorism, this is the priority of the State of Massachusetts? Teachers are the only ones who can hand the child their toothbrush. Who is going to enforce this mandate? What new agency is going to be formed (and funded) to pay for this? If these children were at home with their mothers, would their teeth be brushed at noon? What will be the penalty is a daycare center does not comply? What is the health risk to a child who mistakenly grabs or is handed the wrong toothbrush? Is there any way to store a large number of used toothbrushes in a sanitary environment? This whole idea seems like a nightmare to me. It truly seems to me to be the embodiment of the “Nanny” state. Another Senate race in November just got more complicated. According to The Hill today, Delaware Attorney General Beau Biden will not be running for the Senate in Delaware. When Joe Biden became Vice-President, Ted Kaufman was appointed to fill his Senate seat. Mr. Kaufman has stated that he is not interested in running for the office in November. Representative Mike Castle is expected to be the Republican candidate for the Senate seat. At the same time that Beau Biden annouced that he would not run for the Senate, Representative Marion Berry (D-Ark.) on Sunday became the sixth Democrat this cycle to announce he would be retiring from politics. Representative Berry has stated that he thought the Democrats were overzealous in their pursuit of legislative initiatives like healthcare. The House members that have chosen not to run in 2010 have generally been “Blue Dog” Democrats (theoretically conservative Democrats). Their re-election has been made very difficult by the liberal policies the Obama Administration has espoused. The problem for the Democrats is that although Nancy Pelosi would love to have many more liberal representatives and less Blue Dog representatives, the Blue Dogs have a much better chance of getting elected in most of the country. Many of the current members of the House of Representatives won their elections in 2008 by claiming to be conservative; those members have not voted as conservatives and will have a difficult time being re-elected in 2010. Where Is The Learning Curve On Healthcare Reform ? Scott Brown won in Massachusetts on a three part campaign–he would oppose the current healthcare reform bill, he was opposed to treating terrorists as common criminals, and he wanted lower taxes. With that message he was elected to the Senate in a one-party Democrat state. Sounds pretty clear. Well, maybe not. Today’s New York Daily News reports that the Democrats are still planning on moving ahead with their healthcare reform bill. Oh? I will admit that I am not opposed to some form of healthcare reform–tort reform, portability of insurance, an insurance pool (possibly subsidized by the government) for pre-existing conditions, tax credits for low income people to buy health insurance, and no healthcare insurance for illegal aliens (illegal aliens are entitled to healthcare by law, I just don’t want to see them given free healthcare insurance). However, I would be willing to wager almost anything that a Democrat healthcare bill will not include those things. Healthcare insurance, however, is not my number one priority. I do wonder why the Obama Administration seems to be so reluctant to see that the majority of Americans do not want their healthcare tampered with. Saturday, Byron York, at the Washington Examiner reported on the progress of Charles Grassley’s request to Eric Holder regarding Justice Department lawyers who had privately worked on cases defending Guantanamo detainees. It should come as no surprise to anyone that Senator Grassley’s request for information has gone unanswered. The request was made two months ago. The Judiciary Committee has also sent Eric Holder a letter asking why Umar Farouk Abdulmutallab is being tried in the criminal court system rather than as an enemy combatant. Both of these requests for information from the Justice Department are seen as an indication that the Republicans are moving toward a more aggressive approach to challenging the Obama Administration’s approach to terrorism. A blog I am unfamiliar with called Loud Citizen reported on a speech given by Ray Kelly, New York City Police Commissioner, to the New York Young Republicans Club on Thursday. First of all, I would like to say that I am thrilled that New York has a Young Republicans Club! Mr. Kelly said the usual things a police commissioner would be expected to say-“Crime is down, tourism is up, come to Times Square and see a show.” He mentioned that New York City has surpassed Orlando as the number one tourist destination in America. This decision has made many New Yorkers very angry. The questions after the speech all concerned the upcoming trial and the security concerns involved. One of the side effects of the recent election in Massachusetts is the feeling of empowerment among voters. The residents of New York City are hoping that the Obama Administration will listen to their concerns about having the trial of KSM in their neighborhood. Friday, January 22, In Washington, D. C.
It didn’t get a lot of media coverage, but tens of thousands of people met on the National Mall on Friday to commemorate the 37th anniversary of Roe v. Wade, the 1973 U.S. Supreme Court decision that legalized abortion. CNSNews posted a story covering the event. Since Roe vs. Wade made abortion legal thirty-seven years ago, more than 50 million babies have been killed. I understand that there are rare times when an abortion is a medical necessity. It should not be illegal to perform an abortion in those circumstances. However, abortion is not the same as birth control, and we need to make that clear as a society. As a society, we need to place value on both a mother and her unborn child. We need to make sure that a mother has available to her the resources she needs to see her pregnancy through to term and make the decisions she needs to make that are best for herself and her child. Abortion is not simply a political issue. It affects the lives of everyone involved in the decision. We need to be ready and willing to help in crisis pregnancies and to help those who have had abortions heal emotionally after the process. Hot Air reported on Thursday that three Democrat Senators have signed on to a bill co-sponsored by thirty-five Republicans stating that a rule submitted by the EPA to regulate greenhouse gasses “shall have no force or effect.” The bill would bar the EPA from regulating greenhouse gases. Ben Nelson of Nebraska, Mary Landrieu of Louisiana, and Blanche Lincoln of Arkansas are the three Senators that voted with the Republicans. Ben Nelson and Blanche Lincoln also voted with John Thune (a Republican) to end the TARP program. That vote failed. The writing is on the wall. The American voter does not support radical leftist policies. If the Democrat leadership chooses to ignore this fact, the election in November will be a resounding defeat for the Democrat party. The entire House of Representatives is up for election every two years, so the members of the House have to be careful how they vote. Senators are reelected every six years on a rotating basis. The three Senators named above are all up for election this year. A lot can happen between now and November, but generally speaking, this could be a very interesting year!